What kind of events are you trying to hold? Whether you’re selling tickets for your band’s summer tour or looking to bring in people who would like to listen to a guest speaker at your business, the goal is to accumulate a significant amount of event-goers. Your best first step in picking a venue for your event is to collect bookings through a website. The only problem is that a booking page takes lots of programming knowledge because of its complexity. However, booking pages are nothing new, so there’s no reason to reinvent the wheel. As with most templates, WordPress themes allow you to get started with a design without having to start from scratch. They provide wonderful tools and backend features, along with beautiful frontend designs that you would rarely be able to achieve if you weren’t an advanced developer. Since you’re here to learn about event booking themes, it’s worth mentioning some of the features to look out for when choosing the right theme. 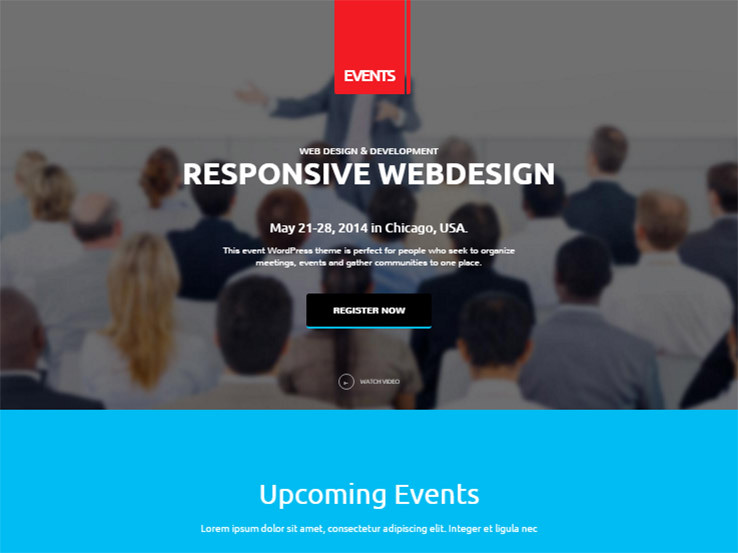 For example, responsiveness is a must-have when selecting from WordPress themes for event booking. People like to book on mobile devices, so that’s non-negotiable. You also want a booking page and profile management module. Look for a theme that includes at least one call-to-action area as they can significantly boost the number of event bookings. Lots of event booking themes are sold online, but we narrowed down the search for you. Keep reading to learn more. 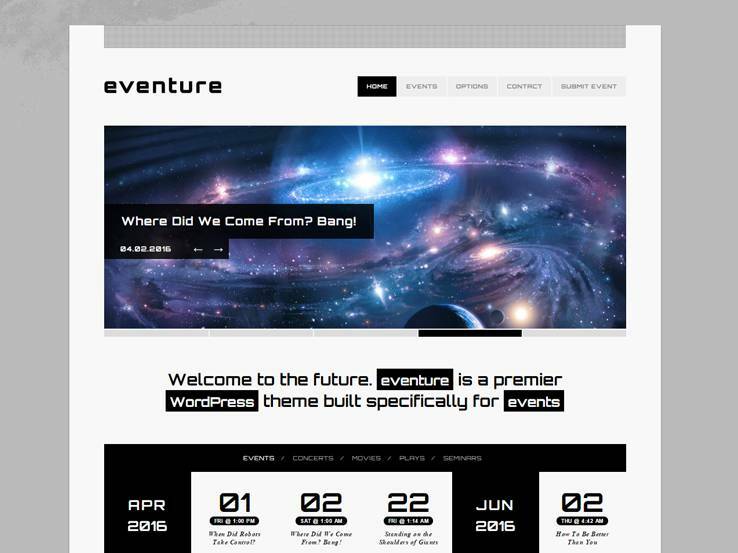 The first theme on our list is the Eventure WordPress theme and it has a beautiful responsive layout made just for companies that plan on selling tickets for events. Sell bookings for anything from seminars to movies and watch as the entire homepage is transformed into a stylish calendar that people can click on to view more information. A slider is included with the Eventure theme, which makes it easier to highlight the most relevant events for people who come to your website. Several social media buttons come with the theme, allowing you to grow your follower counts on Facebook and Twitter. The entire color scheme is more focused on black and white, but you can easily customize it if it doesn’t meet your branding strategy. The events on the calendar are easily managed with detailed event pages just like you would any other WordPress post or page. A large map comes up at the very top of the page and a countdown ticker starts the information list, followed by pricing, websites, age limits, and more. You can include a long event description and incorporate a gallery to show people what to expect. The comment section is rather handy and the advertisement modules are great for bringing in additional money. Overall, if you’re looking for something clean, trendy and trustworthy, the Eventure WordPress theme is one of the best solutions for you. The Conference theme is a unique event theme from the folks at WPLook. 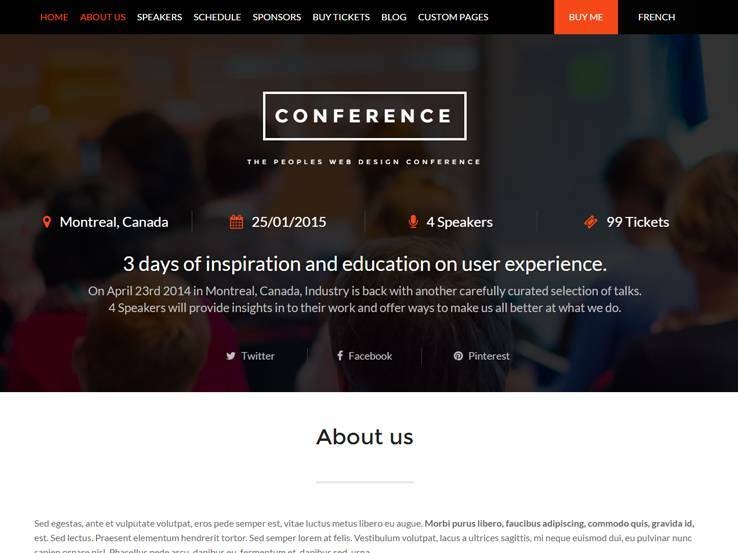 The main goal of the theme is to help you promote conferences and events with a more professional looking WordPress theme. The header module provides a parallax effect, which is great for grabbing the attention of your visitors. In addition to that, you can quickly specify the location, speaker count, and date in the header module. If there’s a limited amount of tickets, this can be shown as well. 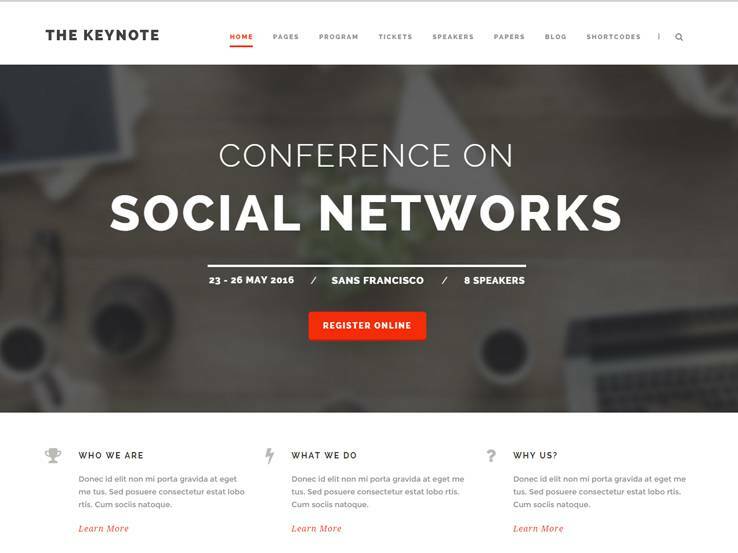 Descriptions and social media links are included with the Conference theme and various call-to-action buttons turn this into more of a landing page than a standard WordPress theme. This is a good thing because landing pages are far more likely to bring in conversations. The theme is also responsive which works great for visitors on smaller devices. Each speaker for your event has a profile where you can share an image and information about them. Show off a full event schedule on the front end and manage that particular schedule from the convenience of your WordPress dashboard. The interactive map is a nice touch and the sponsors’ module ensures that the companies who pay for the event are highlighted in full. Display your pricing plans with the pricing tables and post testimonials from people who have attended the event in the past. The footer module supports widgets so it’s not a bad idea to check out the Conference theme if you’re interested in a business-based event theme. The E-Event theme gets you up and running pretty quickly when it comes to collecting reservations for events. The Tesla Themes theme provides a large counter at the top of the website which counts down the days until the event. The logo sits at the top and you can implement some handy social media buttons to build your other presences. The theme includes a slider that actually works with large header text. This means that it’ll be a little easier to explain what the event is about. This is a theme built for showcasing a single event. In fact, you can share all the events you want, building pages for each one, while also presenting an upcoming events module on the homepage. The E-Event theme provides a beautiful area for showing off the speakers for an event. Each speaker has a picture and links to their own social media pages. You can also outline information about them and explain what organization they have come from. The goal of an events website is to convince people that it’s worth paying a decent amount of money to see the speakers, so it’s your job to make the speakers look as good as possible and this theme allows you to do so easily. The events schedule can also be placed on the homepage. It lets users click on the events and move onto more information if needed. The main partners’ area is best for highlighting your sponsors and the huge map is just what everyone is looking for after they book their tickets and plan for the trip to the event. On top of that, the E-Event WordPress theme includes pricing tables and a solid email subscription form to send out campaigns to people who are interested in the event. 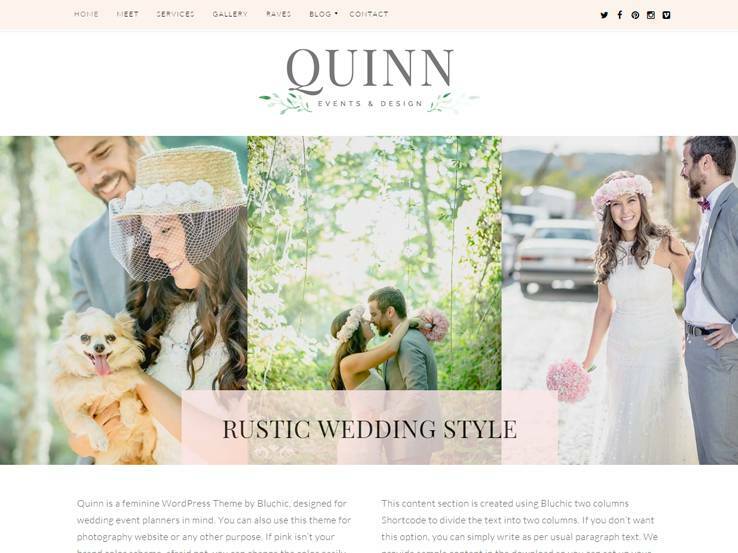 The Quinn theme is a charming and feminine looking event theme. 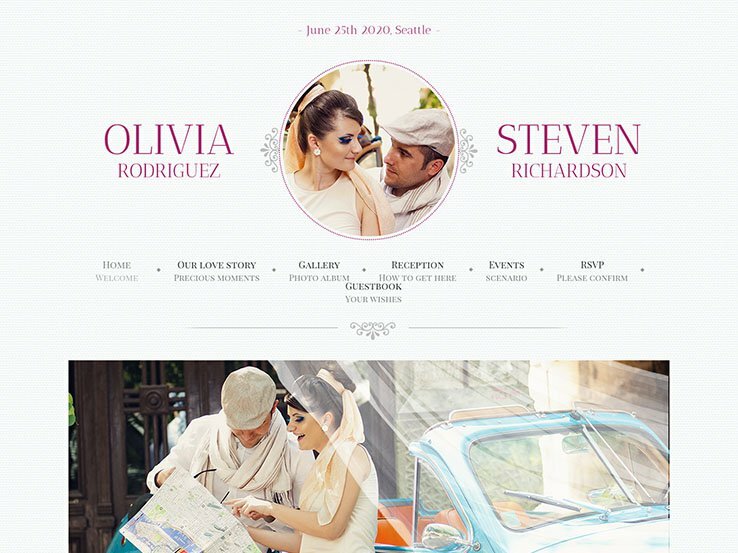 Although marketed as a wedding theme, it can be used for a photographer event or any other creative field. The responsive theme works on just about all mobile devices and the translation files that come with the Quinn theme mean that you market your events to a foreign audience as well. The logo is easy to upload and several social media buttons can be placed in the upper right-hand corner of your theme as well. A large slider combines itself with overlaying text to make it clear as to what the website is all about. Prompt people to sign up for your email list and consider making a portfolio with images that correlate to certain events. The widgetized right sidebar is one of the best ways to fit all your content on a single page, and the infinite scroll feature means that anyone can land on your site and see the majority of your content on one page. The infinite scroll also keeps your site fast since not all of the material loads until the user scrolls down. The three promo boxes are great for advertising and sharing information about your events. The sticky menu ensures that users can easily access the navigation and go to other pages on your website. If you’re interested in an event theme for bands or musicians, consider going with the Event WordPress theme from the folks at Themify. The fluid and responsive layout works on all types of devices and the event post type is exactly what you need to share information about your events. A gallery is included as well and you can create a video page for giving fans a more visual look into what your music has to offer. Social media buttons are included with the theme so you can easily grow your followers and a beautiful sticky menu ensures navigation is accessible at all times. The slider supports images for your events and the overlaying text is generally used for dates and locations. A blog is great for boosting your SEO and sharing updates with your loyal fans. Make as many events as you want and organize them in a striking portfolio format. Each of the events can be clicked on to see more content. The Event theme has a few demos to play around with. Therefore, we recommend you try it out to see if your band or music act could use the boost. It’s not the only way to sell tickets for your upcoming gigs, but it certainly takes out much of the legwork, since you can accept bookings whenever you want. 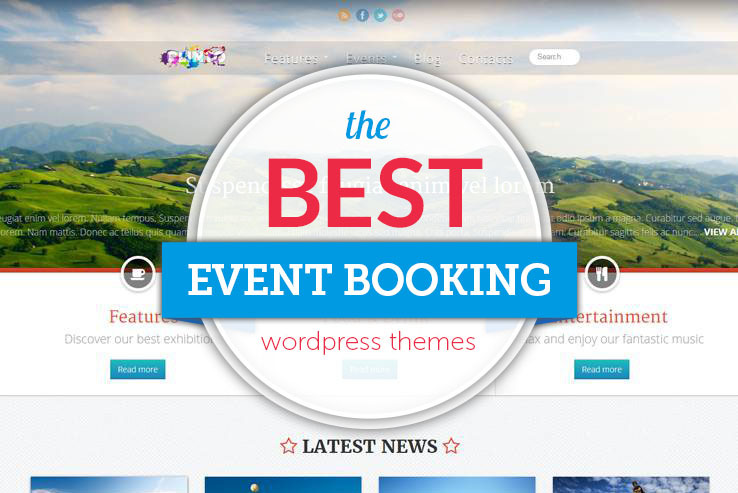 When talking about event booking WordPress themes, it’s essential to keep in mind the folks at Elegant Themes. They have done a good job of creating beautiful themes without all the bells and whistles that just weigh down your site. This one is appropriately named Event, allowing you to create posts and pages for both the physical and digital events you plan on having in the future. All of your past, present, and future events are managed on the backend, making it pretty darn easy when you need to look back and replicate an event that you’re going to repeat. The AJAX powered theme includes some handy tools for making your events and adding information that your customers are going to want for planning. You don’t have to worry about creating event listings at the last minute because it has a full calendar that works nicely for planning your schedule. The event post layout is the bread and butter of the entire operation. It includes a number of fields for filling in the event information and making the listing look nice. Add pricing information or go into detail about location, dates, and more. The five unique colors are a good head start in terms of branding. Complete localization is provided, while various post formats are managed in the well-organized theme options. Several shortcodes are included with the Event WordPress theme, allowing you to create buttons, accordions, and more without touching a single line of code. 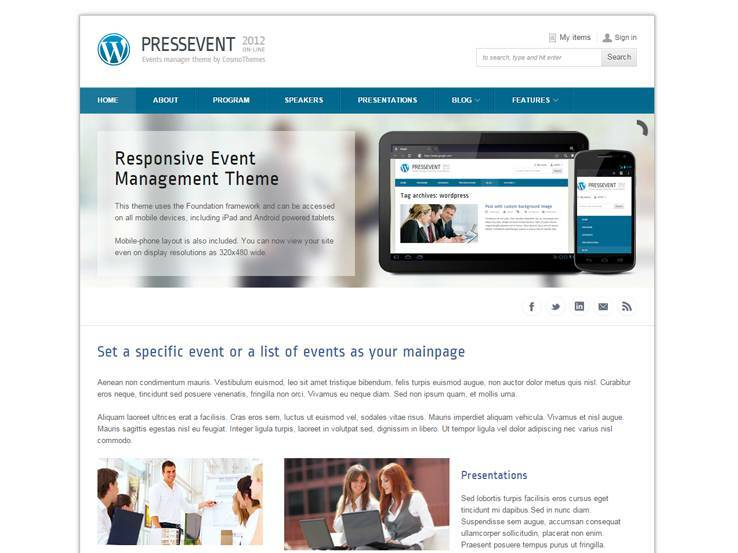 Along with logo upload, a solid menu, and a few widgets to play around with, the Event WordPress theme is a quality choice for those who are looking to build a complete events website. 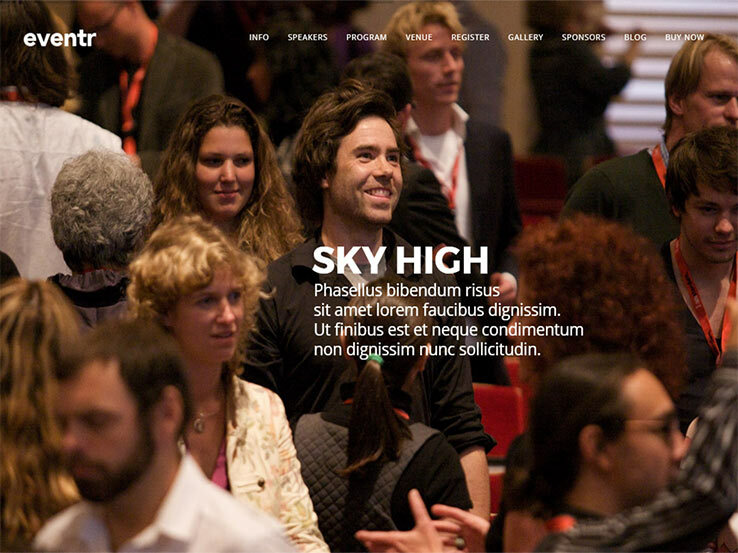 Check out the IgnitionConf theme from CSSIgniter if you’re looking for an elegant one-page theme. It starts off with a beautiful slider that provides immediate information on the date and location of your event. This is followed by a section with a brief description of the event and then you can feature all the speakers that will be giving keynotes. Their information pops up when someone clicks on an image of the speaker and you can easily display a timeline of the event and feature logos of your sponsor. Finally, the page is rounded out by your location information that includes a contact form along with a map of your physical address. The theme integrates beautifully with EventBrite to handle the event management side of things and the responsive design makes it easy to book tickets for your event even on smaller devices. Customization options allow you to modify your colors, fonts, and more. SEO optimization is always a plus and the translation files help you announce and market your event to a worldwide audience. Along with retina ready design, dedicated support, and custom widgets, this theme is definitely worth checking out. 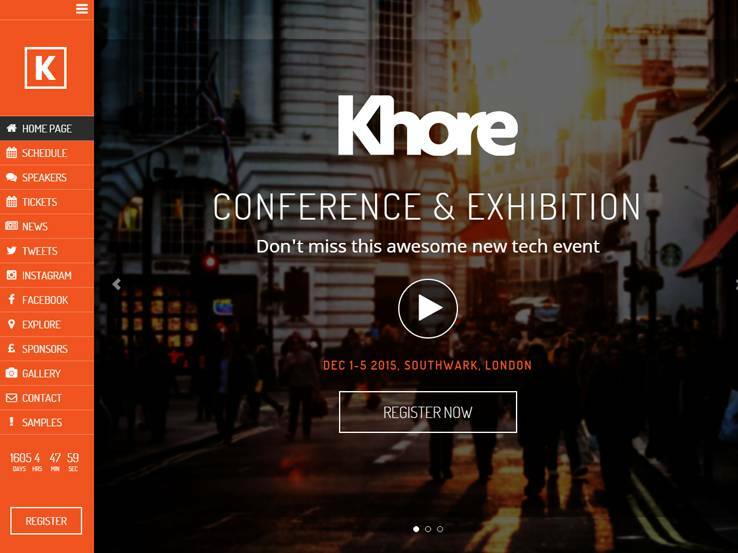 Khore is extremely flexible event WordPress theme that’s been designed with a mobile-first approach. This means your website will look good no matter which device your visitors are using but special care has been taken to ensure visitors on mobile devices have the best possible experience. The layout of the theme is quite unique. It starts off with a near full-screen image featuring a brief description of the event along with a register button. The menu is pushed off to the side and each new section only loads when clicked on. 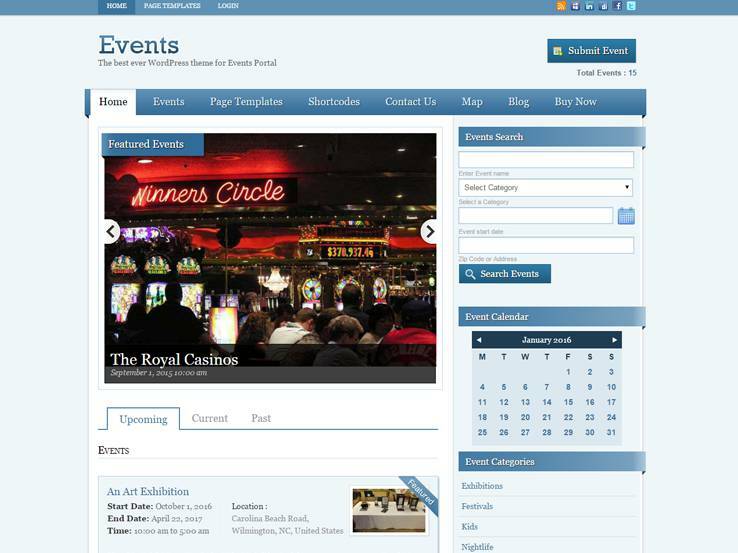 This allows your visitors to focus on your content entirely while still providing all the information about the event. Show off a timeline of events and keynotes, featured speakers, and include a countdown timer to keep visitors aware of when the event is taking place. 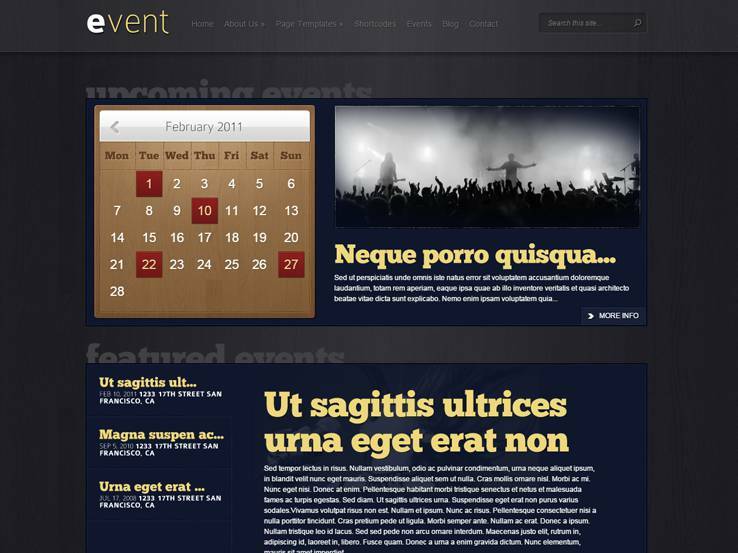 The theme is built with the help of Event Composer which provides a drag-and-drop interface for modifying your layout. This is great especially for beginners who want to stay away as far away from code as possible. Change your colors and fonts with the help of Google Fonts. You can sell tickets for your event through WooCommerce and integrate with EventBrite, EventEspresso, or other event management services for more control. Along with SEO optimization, easy location display, and a blog, Khore has everything you need to create a powerful event website. 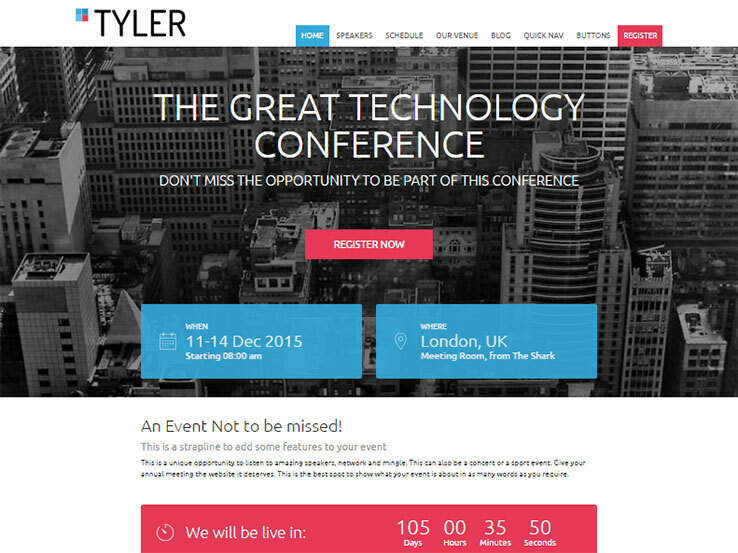 Tyler is a sleek conference theme with a clean design. Your event information is displayed beautifully at the top, along with a register now button. 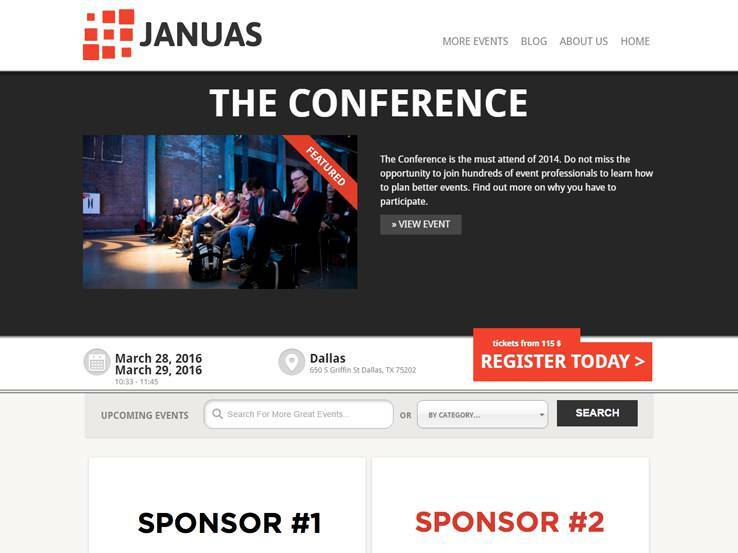 Feature your speakers easily and include a registration form right on the homepage to boost the number of attendees. Featured sessions are displayed in a stylish slider which leads to a page featuring all sessions happening during your event. Different sponsor levels are available and you can easily display them on the homepage. Social media integration is crucial for an event theme and it comes integrated so you can easily share your event on social networks. Media support is also included to share images and videos, too. The theme also includes a map of your location along with a beautiful contact form so people interested in going to your event can easily get in touch with you. The theme is fully responsive and on top of that, it integrates perfectly with EventBrite or EventEspresso for powerful event management. Along with quality support, WooCommerce integration, and different colors for different event types, Tyler definitely packs a punch in terms of features so be sure to give it a try! Featuring a gorgeous black-and-white color scheme, Januas allows you to present upcoming events in an attractive style. Its solid event management features will make it a lot easier to handle multiple events at once. You can create an unlimited number of events with customizable menu for each one. Take advantage of the advanced scheduling options to create detailed event timeframes. Check out the performer options to add and display the artists, speakers, or the expert panel. There are lots of custom widgets available to help you enhance the widget-ready locations. 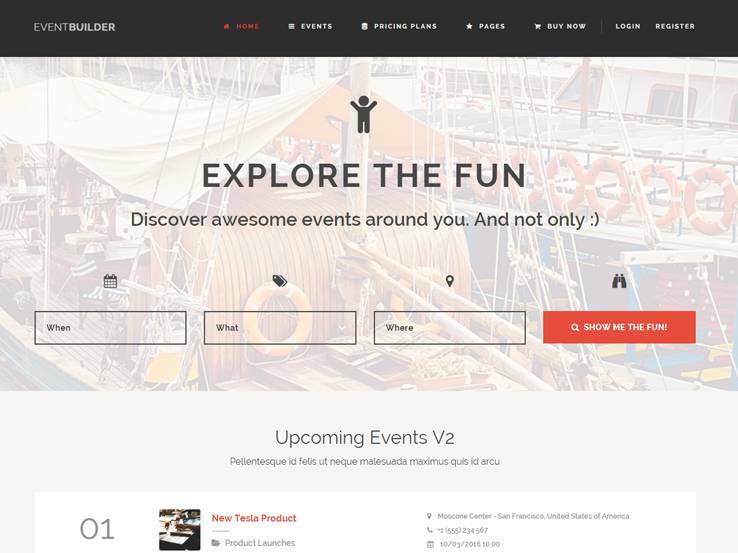 The carefully planned homepage of Events will help you showcase different types of events, exhibitions, and festivals in unique ways. As the page is fully widgetized, you can easily choose which sections you want and re-arrange their position. Use the customizable event submission form to allow the visitors to submit their events. In case you plan to host weekly, monthly, or any other regular events, the integrated recurring events will come in handy for you. Thanks to the Google Maps support, attendees can easily find the location. The fully translatable template enables you to create event sites in other languages as well. 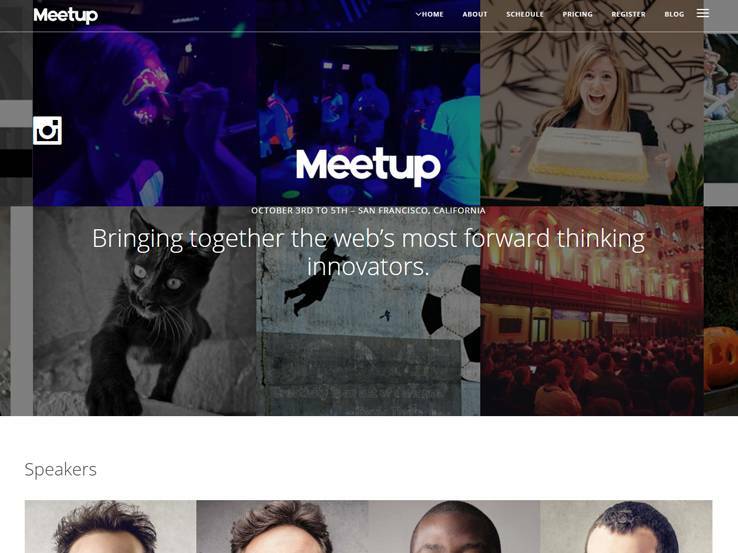 Meetup comes with several header designs and complete Visual Composer integration to build attractive homepage layouts depending on the event. There are 30+ content locks to help you set up unique page combinations. Take full advantage of the multiple menu locations by creating separate menus for different locations. 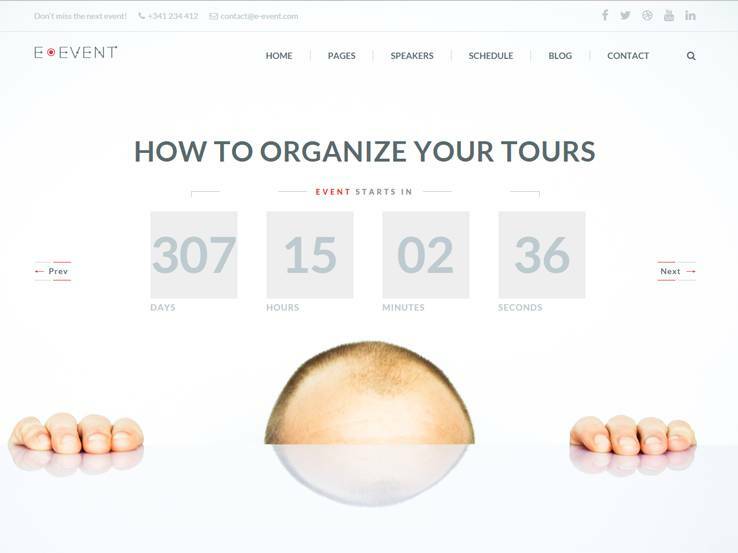 You can use the inbuilt countdown timer to pique the user interest for your event. Interactive features like the lightbox gallery, video backgrounds, and parallax effects will bring life to the regular pages. Live Twitter and Instagram feeds will show the latest updates from your social media accounts. If you are looking for a traditional design for your event site, Clinto could be an excellent choice for you. The theme allows you to display the upcoming events by using the masonry event layout and choose custom colors for particular event categories. Superior venue management options with Google Maps integration will provide the necessary information for the attendees. Feel free to use the inbuilt slideshow to feature the gorgeous event photos. The pre-packaged social sharing buttons will enhance the reach of your events. You will find all the styling options in the customizer panel. 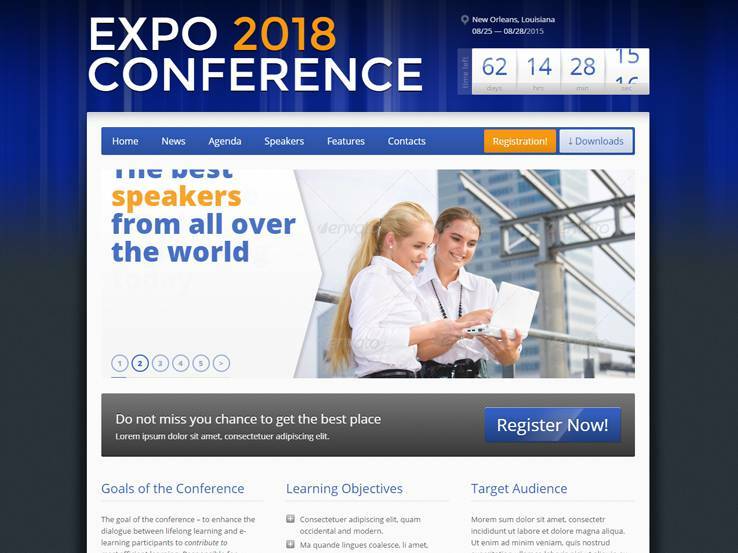 This stylish one-page events theme begins with a full-screen slider of the next events followed by other sections like the program details, speakers, sponsors, contact us, and so on. The handy countdown timer will encourage the visitors to register for the next event. As Rocketick works perfectly with Tickera.com, you can sell event tickets online and earn some extra money. The built-in contact form with Google Maps location will provide multiple communications channels. Check out the in-depth documentation to know more about the various theme features. The simple, minimal layout of Game Over is especially designed for beautiful wedding event sites. Let the visitors know about the romantic journey of this couple by using the built-in love story timeline. The guestbook and Facebook comments integration will enable them to send wishes from all over the world. Lots of custom templates and 100+ shortcodes will help you create the basic website pages. Pick any of the 13+ widgets to decorate the sidebar and the footer. Try the different blog styles and choose a suitable one for the website. This one-page WordPress template provides an easy way to display all the details about your upcoming event. It comes with a strong combination of Visual Composer and Revolution Slider to help you create stunning slideshows and page layouts. Dedicated post types for the speakers, schedule, testimonials, and FAQ can be used to add the relevant event information. The powerful options panel of Eventr will provide you with the essential tools to manage the color, font, size, and other style elements. In case you want to get started quickly, you can do so with the built-in demo data set. 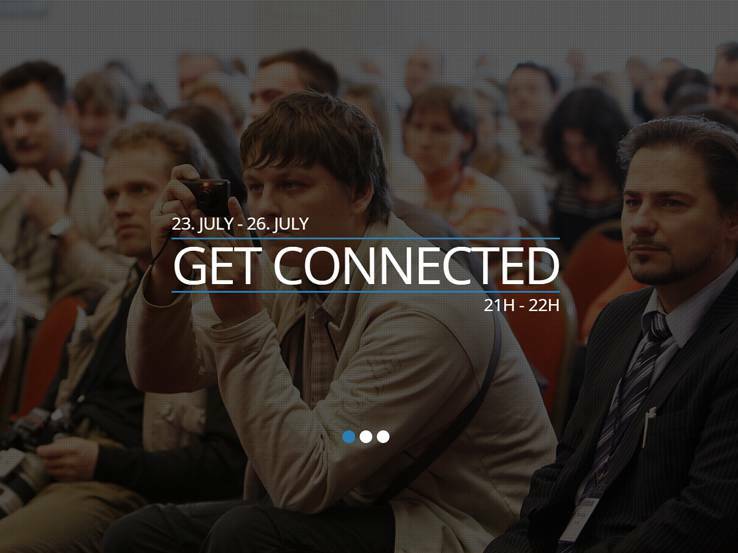 The media-heavy design of Eventory could be one of the best choices to display photos from previous events and show detailed information about the upcoming event. Visitors can take a quick look at the dedicated events calendar to find out the next events. Custom shortcodes will be very useful to add extra elements to the regular pages. Several beautiful blog styles will make your blog posts look more attractive. You will find lots of other styling options in the powerful admin panel. Thanks to the full WooCommerce integration, it is also possible to sell event tickets and other merchandise from the site. 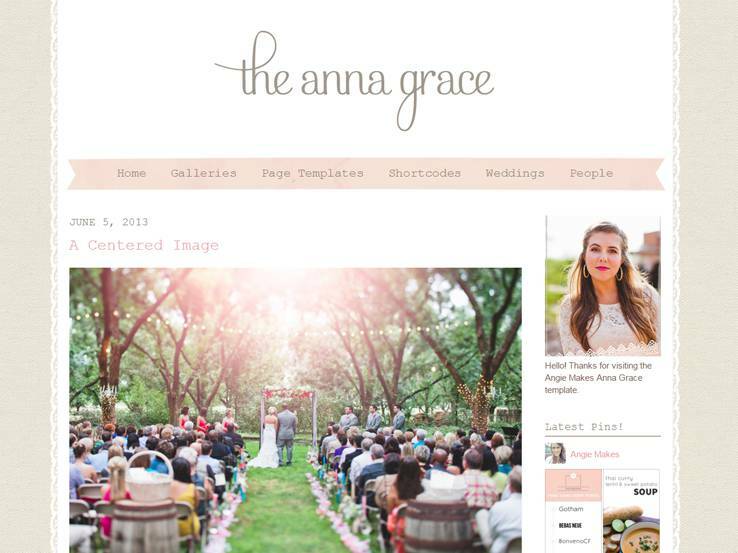 You need a special WordPress template like Anna Grace to create a website for your next feminine event. It features several header styling options so that you can present the pages in different ways. With the multi-level drop-down menu support, visitors will be able to find their way quickly around the site. When it comes to creating the standard pages for the site, the readily available layouts will make your job a lot easier. Place the custom widgets on the widgetized locations, and manage the admin options from the control panel. Take a look at the video tutorials for detailed instructions. 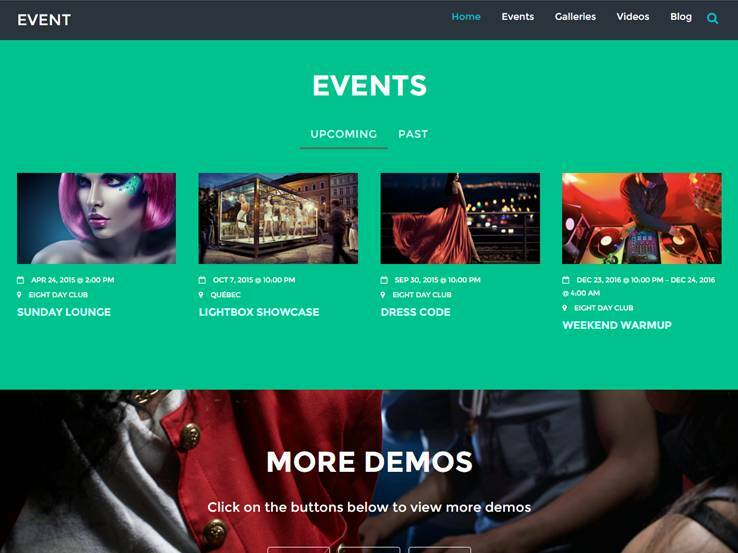 The multi-purpose Eventbox theme enables you to develop different types of event websites including regular events, exhibitions, competitions, festivals, and so on. You can create as many events as you want with multi-day schedules. There are dedicated options to add the speakers, sponsor, or exhibits for the events. Invite people to join your event by using the theme-provided registration form. Use the bundled designs, shortcodes, and widgets to build unique post and page layouts. The WPML-supported template also works correctly with WooCommerce. Events will welcome the visitors with a large hero image to display the date, time, and other details for the next event. The animated homepage will keep them engaged, while complete Eventbrite integration will help you to plan, manage, and promote your event. Dedicated custom fields for the events, speakers, and sponsors have made it very easy to add the basic event information. Use the shortcodes to display featured events in various locations on the site. The mobile-optimized template will adapt the layout according to the visitor’s screen resolution. 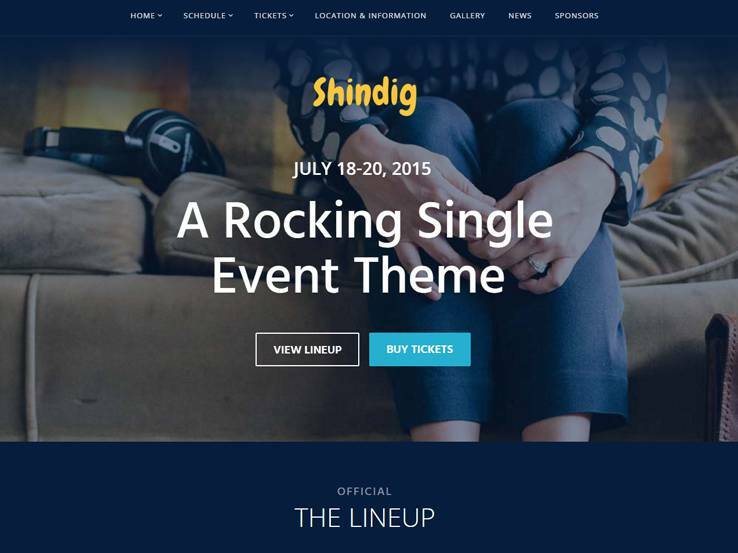 Shindig is perfect for creating a fully featured website for your multi-day premium event. Its tabbed schedule will allow the participants to check out the event details. You can use Slider Revolution to create and display attractive event slideshows. With full e-commerce support, the template enables you to sell event tickets and other merchandise right from your site. As it is developed on the powerful HTML5 boilerplate, your website will work great on all device types. If you are short on time, feel free to use the pre-packaged set of demo content to get started. 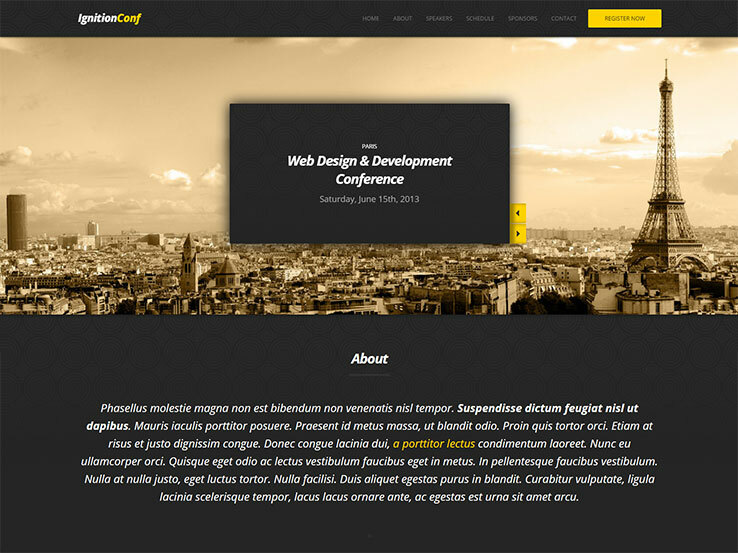 Conference offers a unique combination of one-page and multi-page layouts for your event website. The front page offers details about the upcoming event, while you can have separate pages for the speakers, schedule, sponsors, gallery, team, etc. There are eight custom post types and 12 widgets so that you won’t have to be limited with the default options. Eventbrite and PayPal support will help you manage the event, sell ticket, and collect the payments. Other features like the unlimited color schemes, built-in child theme, fast loading speed, etc. have made Conference a popular choice. In case you want to publish a lot of blog posts on your event site, PressEvent could be one of the best picks for you. The template enables you to create an unlimited number of events with Google Maps direction. Integrated custom fields will come in handy to add detailed information about the events. Activate the login and registration forms and allow the visitors to login with their Facebook profile. They can purchase event tickets by using the PayPal payment system. Also, make sure to check out the 14 theme-provided widgets along with the default ones. 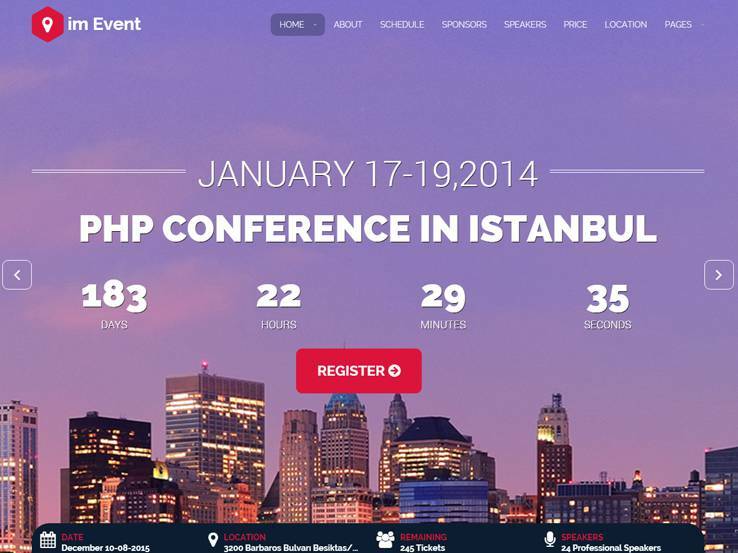 im Event comes with several front page layouts so that you can choose the most suitable design for your event site. It is possible to add the registration and contact forms to the slider and make it a lot easier for the participants to join your event. Non-profit event organizers will be thankful for the unique donate option. 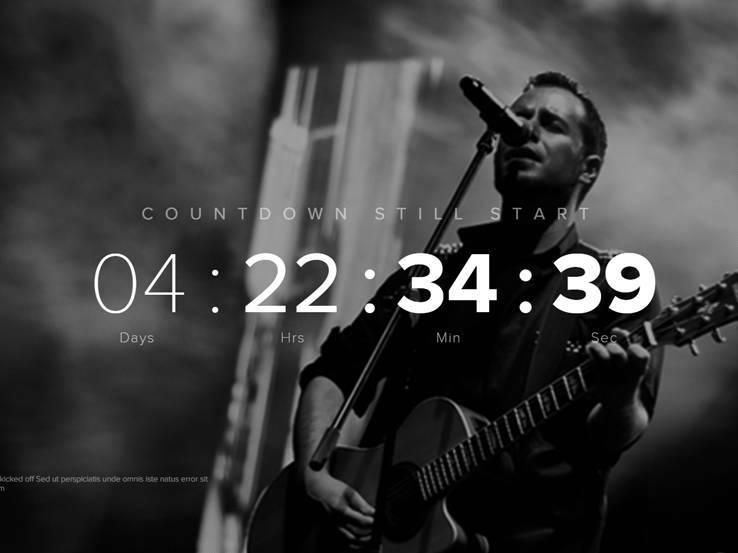 Add an introductory video to the main slider and show a countdown timer to act as a reminder. Full Eventbrite support will provide you with a professional platform to manage the events. The RTL-ready layout is available in both light and dark variations. Despite its simple look, Expo18 offers all the necessary features you expect from an event site. The customizable homepage allows you to choose which content you want to display. Feel free to create personalized page layouts by using the visual editor and shortcode generator features. Enhance your pages with the animated background or use your own images or patterns. Visitors can use the basic registration form to sign up for the event. Choose the preferred sidebar position and decorate it with the custom or default widgets. Head towards the options panel to manage the styling aspects. 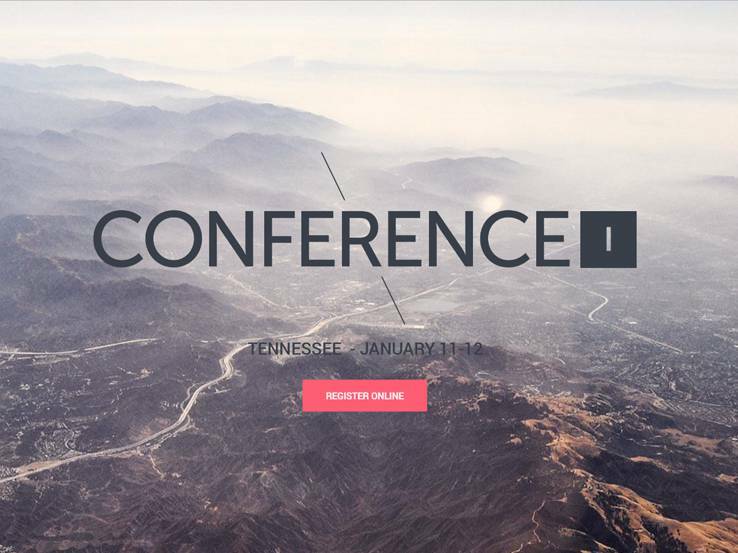 Coming from GoodLayers, The Keynote is a gorgeous event, conference, or exhibition template for WordPress. You can create stunning content layouts by using its integrated page builder and the beautiful parallax sections. Adding the speakers and sessions information is very easy, thanks to the dedicated post types. Detailed program schedule will help the audience to set up their itineraries. They can check out the speakers’ panel to know more about the guests. Thanks to PayPal ticket payment, potential attendees can purchase tickets right from the event page. 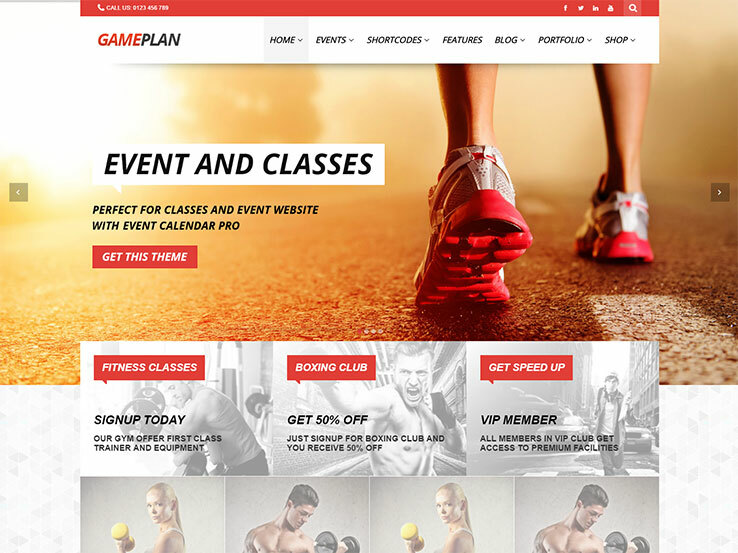 The cleverly designed layouts make Gameplan a great choice for creating event sites related to gym or physical activities. It includes premium plugins like Visual Composer and Revolution Slider so that you can create customized post and page designs. Add different types of elements by using any of the 40+ shortcodes. Complete Events Calendar pro support will let you manage all the events from your dashboard. The advanced admin panel includes lots of personalization options for the site. The WooCommerce-ready template comes in dark and light versions and the whole set of demo content. Unlike the other themes mentioned in this post, EventBuilder is an event directory template that allows you to showcase different types of events. It enables the visitors to submit their events and register, login from the front-end. Built-in ticketing system with PayPal and Stripe makes it possible to sell tickets and collect the payment. Choose any of the professional map styles to feature the upcoming events with their locations. Two integrated ad slots will be the best places to show third-party ads. 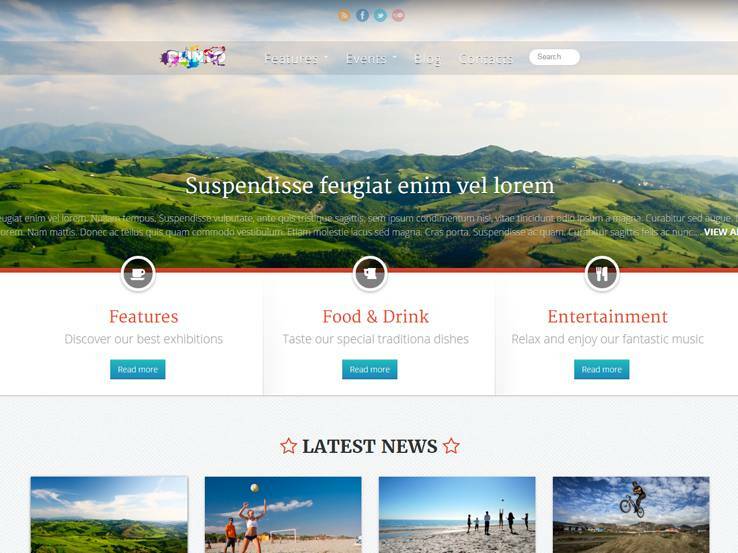 The theme also includes several ready-made pages, shortcodes, and some necessary widgets. This specially designed WordPress template is perfect for creating music, party, DJ, or any other entertaining event sites. The prominent display of the events will be very useful to draw the attention of your visitors. 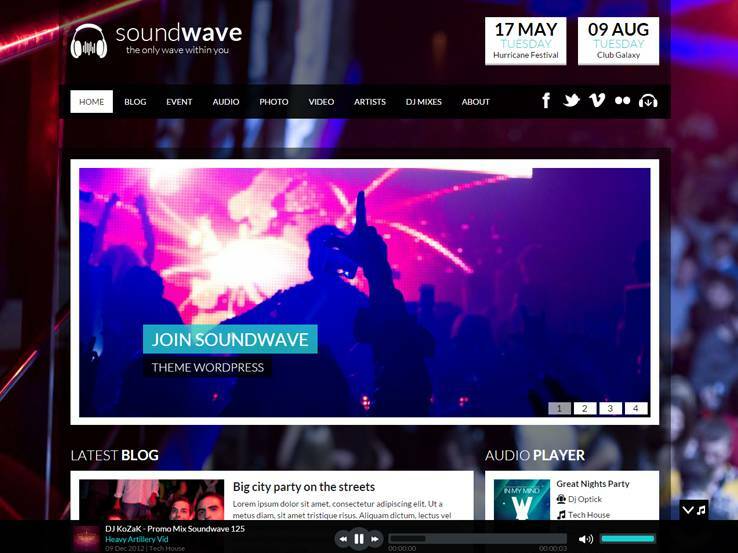 SoundWave’s unique radio station feature will let you create custom playlists and play music on the website. Showing off the photos and videos is very easy, thanks to the photo album support along with YouTube and Vimeo integrations. The superior options panel provides a one-stop point to access all the styling elements. 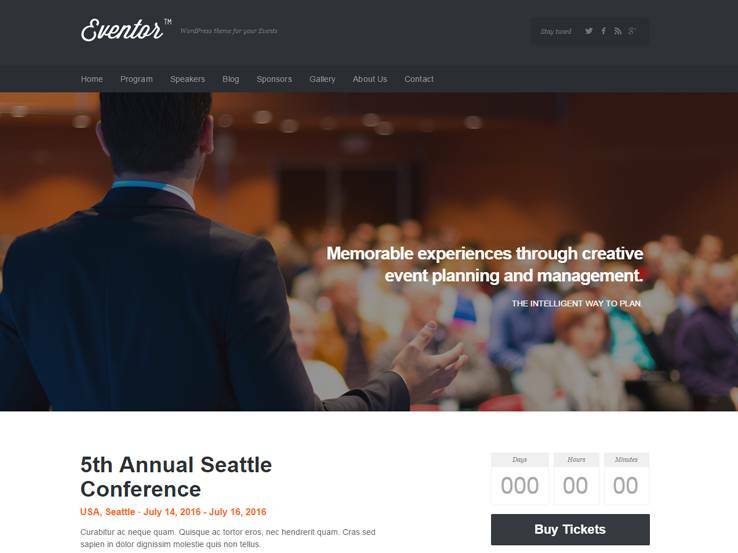 Try out the Eventor WordPress theme if you’d like an events website with a responsive design and a complete program schedule. It includes a spot where you can talk about the people who are going to speak at the event. Offer bios, along with interesting media from the entire lineup. Unlimited colors and sidebars spice up your branding and the ad manager allows you to display ads to earn additional income. Combine your ad manager with the AdSense interface or simply insert your own ads. The translation options are ideal for event websites. It allows you to translate your entire website into any language and reach an international audience who might be interested in attending your event. The responsive layout looks wonderful on smaller devices, while the Revolution slider includes interesting options for grabbing the attention of your visitors. You can create a slideshow of all of the upcoming events and even incorporate a button for users to learn more. The sidebar manager comes in handy, while the shortcodes are guaranteed ways to keep out of the messy source code. Try the custom widgets if you’re looking to get creative and consider using the PSD files if you have more experience as a designer.